As an occasional baker and a fan of children's books, I knew I had to check out this picture book. It is only September (and not even chilly out yet! ), but I'm already thinking about the winter holidays, frosting cookies, and warm mugs of chocolate and cider. If you bake and will have any small children at hand this winter, Amy Fellner Dominy and Nate Evans’ picture book Cookiesaurus Rex, illustrated by A.G. Ford is a fun read-aloud pick. Cookiesaurus Rex is looking forward to be decorated, but that excitement quickly turns to frustration when he sees his fellow cookies decorated with stars and sprinkles while he only has simple green icing and a black top hat. So Cookiesaurus decides to go rogue – except he doesn't get quite the revenge he wanted. He's decorated as a dinosaur ballerina, a duck, a baby (complete with chocolate chip poo!) instead. In between those episodes he decorates himself as a ninja and a superhero, only for it all to be wiped away. In the end he goes hog wild with decorations and declares himself the King of All Cookies - but there's a catch! 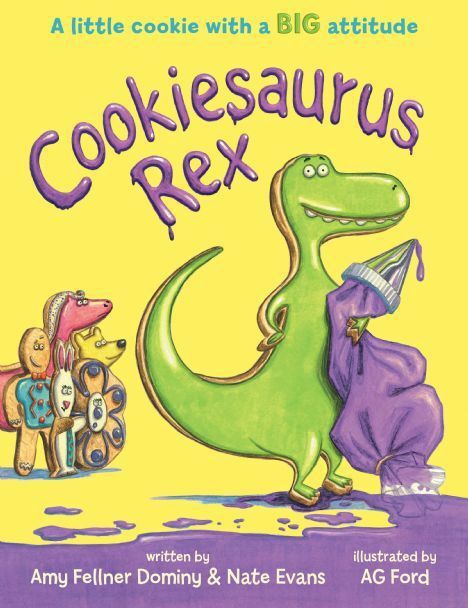 Cookiesaurus Rex is engaging and silly fun, with a cookie main character full of attitude. The dialogue will make kids laugh and adults smile, and the content (and ideas for decoration) would make it the perfect complement or preview to a cookie decorating session. In fact, I was inspired to buy a T. Rex cookie cutter myself and try my hand at recreating some of Cookiesaurus' looks. Unfortunately, I didn't use icing tools so it ended up a little sloppy! Of course, you don't have to wait for winter to have a cookie-baking and -decorating session, and there's no hint of holiday affiliation in the book itself, so this title works for everyone and year-round fun. Cookiesaurus' antics are sure to amuse and inspire all who read the book. 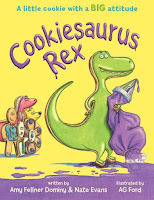 In all, Cookiesaurus Rex is a fun, sassy picture book suitable for all ages, and especially for bakers and their minions. Recommended for: fans of baking, cookies, dinosaurs and dialogue-heavy picture books (the ones you do voices with!). Cookiesaurus Rex will be released by Disney-Hyperion on September 26th, 2017. Fine print: I received an advance copy of this title for review consideration. I did not receive any compensation for this post. 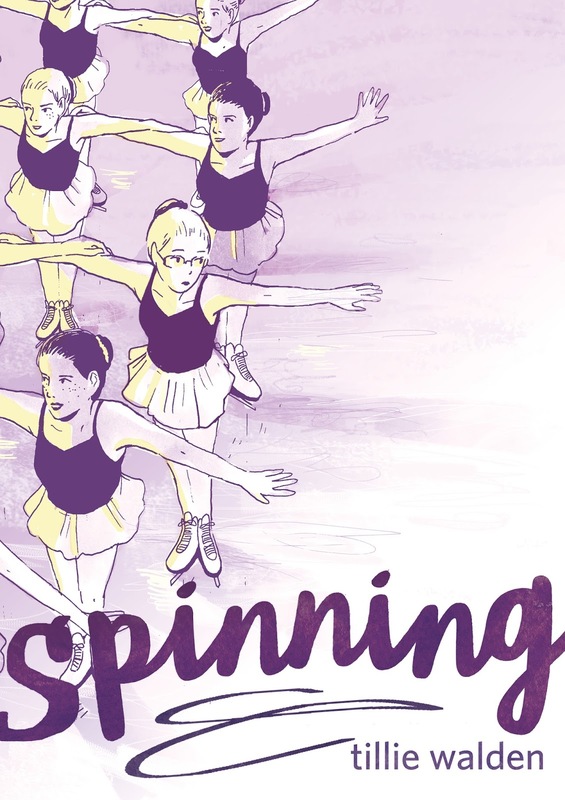 Today’s post is part of the blog tour for Tillie Walden’s illustrated memoir, Spinning. Walden is the author of one of my favorite webcomics, On A Sunbeam, and is a decorated comics artist as well as an all-around lovely person. Read on for an interview and a brief review of Spinning! It seemed like one of the themes of this book was solitude and a sort of loneliness, even when deeply involved in a team sport. Do you/did you recognize that as you put together the story? Honestly, no! I noticed it afterwards. Which is hilarious to me now. It’s amazing how blind we are to ourselves and our patterns. But I’m glad that comes out in the book. I think it’s very easy to believe that team sports are an endless show of camaraderie and togetherness, but I found it all extremely isolating. And I imagine I’m not the only person to feel that way. Ice rinks, to me, are also especially lonely places. They’re freezing cold, and they’re either full of bright lights or kind of stuck in the shadows. And those locker rooms were just depressing. Full of leftover air from the ice and stressed out girls in full make up. Writing and illustrating a memoir means drawing younger you a lot - did you find that easy/difficult/in-between? Did you refer to pictures? I didn’t use pictures to reference. I was pretty easy to draw, luckily. I had long blonde hair and glasses, and I just sort of ran with that. I knew going into it that my drawings of myself would be interpretations, so I was ok with any inaccuracies. 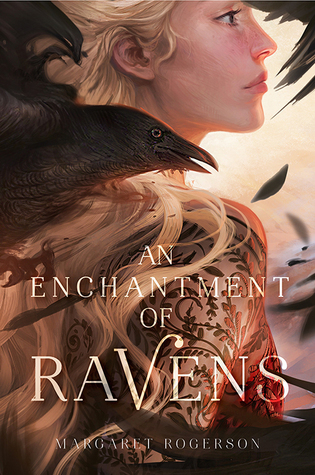 What's the last thing you read (aside from your own work), and what are you reading now? Omg, I love this question. I wish people asked me this more. SO, the last thing I read was The Devotion of Suspect X by Keigo Higashino, and it was totally amazing. But all the prose I read is almost entirely mystery or crime dramas. I’m a little obsessed. And currently I’m reading the next book after The Devotion of Suspect X, which is called Salvation of a Saint. They’re detective thrillers set in Tokyo. Come on, how could I not read this? Tillie Walden is a two-time Ignatz Award–winning cartoonist from Austin, Texas. Born in 1996, she is a recent graduate from the Center for Cartoon Studies, a comics school in Vermont. Her comics include The End of Summer and I Love This Part, an Eisner Award nominee. Interested in reading more about Spinning and Tillie? Check out the full tour schedule here, or just click on any of the links below! Have I convinced you to pick up Spinning yet? If not, check out my mini-review below! Figure skating was Tillie Walden’s life. She woke before dawn for morning lessons, went straight to group practice after school, and spent weekends competing in glitter and tights. It was a central piece of her identity, her safe haven from the stress of school, bullies, and family. But as Tillie's interests evolve, from her growing passion for art to a first love realized with a new girlfriend, she begins to question how the close-minded world of figure skating fits in. Poignant and captivating, this powerful graphic memoir captures what it's like to come of age, come out, and come to terms with leaving behind everything you used to know. 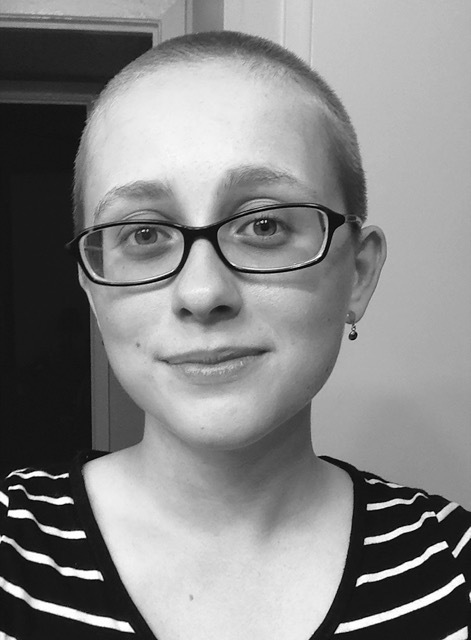 Tillie Walden grew up figure skating, and while she found success on the ice, she faced many challenges off it. Those awkward, weird, and sometimes wonderful young adult years are detailed in her beautifully illustrated graphic memoir, Spinning. I identified strongly with Tillie’s experiences skating as both an individual and in a team – I was a competitive swimmer all the way through college. The isolation of competition, the gossip and enforced together-ness of the team all resonated. Pair that with Tillie’s scholastic struggles, her forays in youthful friendship, burgeoning artistic talent, and her relationship with her first girlfriend, and the book is brimming with all of the bits and pieces of life that seem to come at you 100mph during the teenage years. It’s not easy, of course, and Tillie’s experiences with bullies and worse are detailed as well. Tillie has written and illustrated not only her life from memory, but also a highly relatable book for teens and young women everywhere. It’s honest and beautiful and poignant and sad and all of the things that life is while you’re living it. I loved it. Recommended for: young women ages 11 and up, especially introverts, artists, and those into sports.